Home Entertainment news New Spider-Man Villain, the Vulture Explains. New Spider-Man Villain, the Vulture Explains. Like a carnivorous bird, the first trailer for the latest Spider-Man reboot, 2017's Spider-Man: Homecoming, has descended upon the internet. In it, we meet an avian gent who, though unnamed in the clip, has been confirmed as being none other than the Vulture, a longtime Spider-Man foe. He's played by Michael Keaton, and he will serve as the film's high-flying antagonist. "What?" you may find yourself asking at this point. "Vulture? You mean the website I'm reading right now?" Oddly enough, that's not what we mean! But don't feel bad — the Vulture isn't the best-known Marvel villain, so it's perfectly natural to have questions about him. Please sit back and allow Vulture to explain the Vulture. What’s this guy’s basic deal? “The Vulture” is a moniker used by four different Spider-Man villains, all of whom can fly, which is their main thing. Wait, there’s more than one Vulture? Yeppers. The first and most-often-seen one is an elderly dude named Adrian Toomes, who builds an apparatus with razor-sharp wings and turns to a life of high-flying crime. He also uses various means to grant himself unnatural youth. Later, a prison cellmate of Adrian’s named Blackie Drago steals his flying machine and goes on his own reign of terror, though Adrian quickly gets it back. A biology professor named Clifton Shallot also nabs the apparatus and merges his body with the device in a fit of rage after one of his classes is canceled. Finally, a former Mob enforcer named Jimmy Natale is subjected to an experiment that turns him into a flying menace who assumes the Vulture name and terrorizes New York until the Punisher kills him. Talk about a flock of Vultures! Wait, is a group of vultures called a “flock”? Oh, weird. So which one is Michael Keaton playing in the new movie? Still from Spider-Man: Homecoming. Photo: Sony Pictures. That is, indeed, hella sick. What kinds of powers does the Vulture — er, do the Vultures — have? It depends on which Vulture we’re talking about. As we established, they can all fly, and all of their wings can cut you up real good. Adrian’s apparatus also grants superhuman strength and endurance, and he’s occasionally used pseudo-scientific means to steal the youth and life force of other people. The Clifton and Jimmy versions also mutated to the point where they resembled birds. Jimmy could also spit acid, for some reason, and ate people. Have any of them had an actual vulture as a sidekick? No. But, now that you mention it, that seems like a real oversight. What are their various motivations for evil-doing? Adrian was generally misanthropic and got pissed off when he lost his job, but after a while, he was just sorta into crime. Blackie wanted to make money through robbery. Clifton was mad about the world not appreciating him. Jimmy didn’t really have an option — he was turned into a mindless killer by those who experimented on him. How long have people going by the name “the Vulture” been swooping around the Marvel universe? Quite a while! 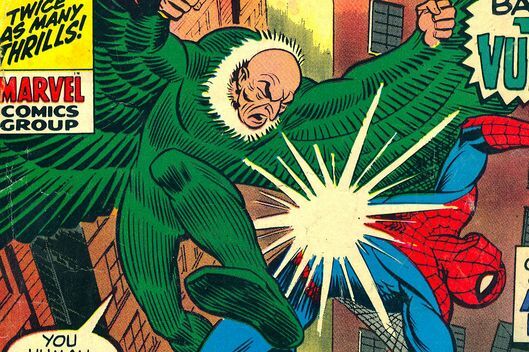 The Adrian Toomes version of the Vulture first appeared in the second issue of The Amazing Spider-Man, way back in 1963. He was created by one of the most successful creative teams in comics: writer Stan Lee and writer-artist Steve Ditko. How important is the Vulture? Somewhere between a first-tier and second-tier Spidey villain. The character’s various incarnations have shown up a hell of a lot over the decades, but he’s never really captured the imagination in the way that, say, Green Goblin or Venom have. Have we seen him in a movie already? Not exactly. There were plans for John Malkovich to play him in Sam Raimi fourth Spider-Man movie, but the movie never came to be. He was also supposed to appear in a sequel to The Amazing Spider-Man 2, and there was even a brief glimpse of the wing apparatus in a background shot of that movie. But those plans were derailed by troubles at Sony, who opted to partner with the Disney-owned Marvel Studios to co-produce next year’s web-crawler reboot. He has a long history of teaming up with fellow nasty types. He was a founding member of classic supervillain squadron the Sinister Six, as well as its successor, the Sinister Twelve. He also briefly served on the Legion Accursed, a team led by an actual demon from hell. Is Michael Keaton a good choice to play the Vulture? Sure! He seems more likely to play up the “aggrieved and vengeful scientist” angle than the “elderly man looking to steal other people’s vitality” one, but he’s good in everything, so he’ll probably nail whatever he does. Plus, he’s already played a bird! Has the Vulture ever written for Vulture? Not yet. But by gum, we’re gonna do everything in our power to change that before Homecoming comes out.